Recently, a group of local bloggers were invited to check out a new shopping area in Maryland called, Pike & Rose. It’s a small enclave of new condos and apartments with a generous sprinkling of casual eateries, national and local retail shops. As a new blogger, I was tapped to come out to the blogger event by one of the Pike & Rose representatives. I had no choice but to accept the invitation to partake in two of my favorite past times, an evening of eating and shopping! Before the event, I visited the website to see what kind of shopping was offered. As far as clothing retailers go, there is a Francesca’s, a recently opened Gap, a Lucky Brand, and a Nike Store. Cool! At the event, the evening got started in a store I was most intrigued with called Seasons Olive Oil & Vinegar Taproom. It’s a retail space that specializes in quality olive oils and aged vinegars from Spain and Italy. 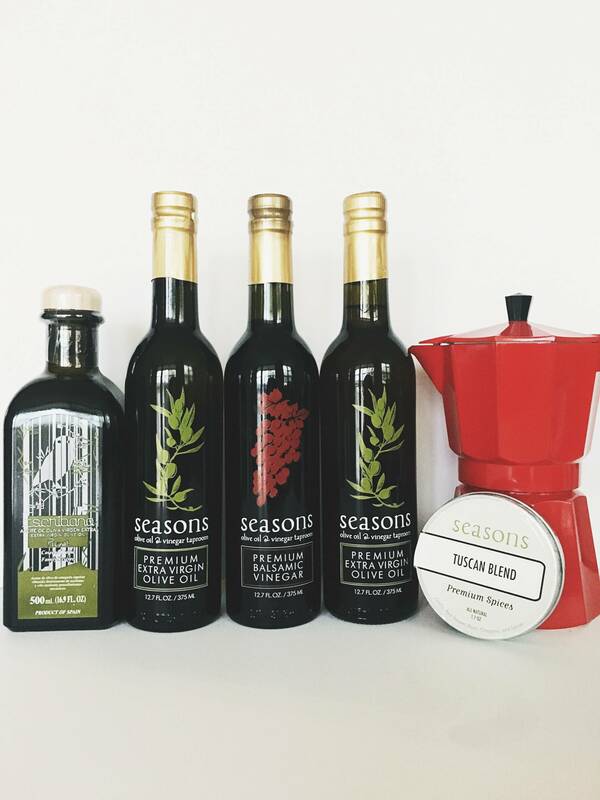 This place does not sell your average grocery store variety oil, the Seasons staff are actual purveyors of the product and they believe in selling a product that is pure and of the highest quality. It was quite interesting to hear how the olive oils are sourced because a lot of oils that are on the grocery store shelves are not true olive oils as they are, in some aspect, mixed with other oils like canola oil. As it turns out is not good for you. But that’s a subject for another day. The owners of the store were very helpful with information about their large array of products. Whatever item caught your eye and whet your palate, you could actually sample. They suggested oils for your favorite meals and even offered written recipes to try with your oil or vinegar of choice. As a blogger, I was gifted with a $50 gift card to shop with. Not only did I blow the whole $50, I purchased some additional products with my own money because the products are just that good! At the event, there was a beautiful array of appetizers that were begging to be eaten! One of my favorites were the Watermelon and Feta Bites. Dressed with their in-house Pomegranate Balsamic vinegar, it was an interesting and refreshing way to try Seasons exotic vinegars! It was simply yummy! As I perused the store, I walked out of the store with a Garlic and Chipotle-infused Olive Oil and a Dark Chocolate Balsamic Vinegar! I was told that the choice of the Chipotle-infused Olive Oil and Dark Chocolate Vinegar were an excellent combination because both can be used to marinate meats or they would be great with a cheese tray. I want to actually bake with the Dark Chocolate Vinegar. I’m not a recipe developer (yet), but I’m sure I can find a great recipe to use this with!